Ginn brought in three of six targets for 58 yards during the Saints' 26-23 overtime loss to the Rams in Sunday's NFC Championship Game. He also fumbled once but it was recovered by the offense. Ginn (knee) brought in three of seven targets for 44 yards in the Saints' 20-14 divisional-round playoff win over the Eagles on Sunday. Ginn (knee) doesn't have a designation for Sunday's divisional-round game against the Eagles, Nick Underhill of The New Orleans Advocate reports. 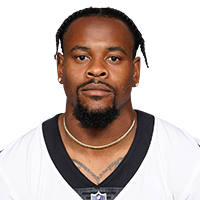 Ginn (coach's decision) is inactive for Sunday's game against the Panthers, John DeShazier of the Saints' official site reports. 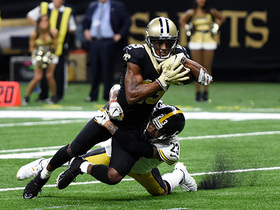 Saints wide receiver Tre'Quan Smith suggested Ginn may not play in Sunday's game against Carolina, Josh Katzenstein of The New Orleans Times-Picayune reports. "With Ted being down this week, I'm going to be taking the majority of the load," Smith said after Friday's practice. Analysis: After returning from injured reserve last week to catch five passes for 74 yards, Ginn doesn't have an injury designation for Week 17 but nonetheless may be rested as the Saints prepare for a playoff run. With Teddy Bridgewater already confirmed as the starter and Smith hinting that Ginn won't play, it's probably safe to assume Michael Thomas, Alvin Kamara and Mark Ingram will have limited roles if they play at all. Ginn (knee) doesn't have a designation for Sunday's contest versus the Panthers, Herbie Teope of NFL.com reports. 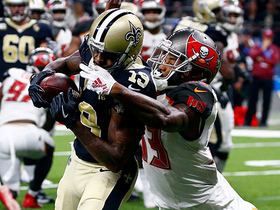 Analysis: Whether Ginn actually plays remains to be seen, though. Coach Sean Payton won't risk Drew Brees' health and is starting backup QB Teddy Bridgewater in the regular-season finale, so a veteran like Ginn may receive similar treatment with an eye toward the playoffs. Making such a decision easier is Ginn's knee issue, which limited him in practice Thursday and Friday. If the Saints opt to hold out Ginn, Tre'Quan Smith, Keith Kirkwood and perhaps Tommylee Lewis would benefit in his absence. Ginn was listed as limited on Thursday's practice report due to a knee injury, Luke Johnson of The New Orleans Times-Picayune reports. Analysis: Ginn managed such an issue before landing on IR on Oct. 18, where he remained until last week. 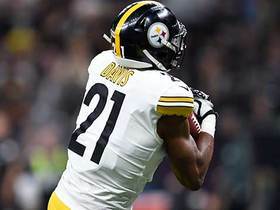 In his return this past Sunday versus the Steelers, he played 41 percent of the offensive snaps en route to five catches (on eight targets) for 74 yards. His sudden appearance on the Saints' second Week 17 injury report is some cause for concern, but it could all vanish again by the release of Friday's version. Ginn caught five of his eight targets to total 74 yards in Sunday's 31-28 win over the Steelers. 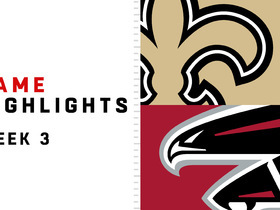 Ginn is active for Sunday's game against the Steelers, Mike Triplett of ESPN.com reports. Analysis: Ginn, who last suited up for a game in Week 4, is in uniform Sunday, but it's unclear how heavily he'll be utilized after having just returned to practice this past week. He's therefore a risky roll in Week 16 fantasy lineups, but his return will bolster the Saints' wideout corps with the NFL postseason looming. Ginn (knee) has been activated from injured reserve and will join the 53-man roster, Field Yates of ESPNreports. Analysis: As a result, Ginn is eligible to play Sunday against the Steelers, however it's unclear if the Saints will actually utilize their speedy wideout right away or choose to play it safe given they need either a Bears loss or win in either of the next two weeks to clinch either the No.1 or 2 seed in the NFC. Ginn hasn't played since Week 4 thanks to a knee injury, but presents a much-needed element of explosiveness for a Saints offense that has struggled in recent weeks. Ginn (knee) resumed practicing Wednesday, Josh Katzenstein of The New Orleans Times-Picayune reports. Coach Sean Payton said there's a possibility Ginn (knee) returns from injured reserve this season, Mike Triplett of ESPN.com reports. 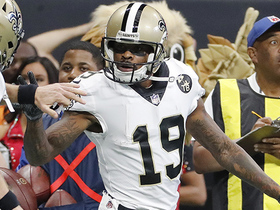 New Orleans Saints wide receiver Ted Ginn Jr. makes his first catch since returning from IR for 15 yards on a pass from his quarterback Drew Brees. 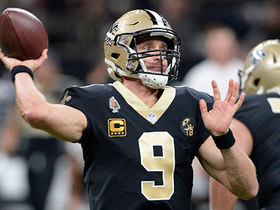 NFL Network's James Palmer highlights the personnel developments that could happen for the New Orleans Saints over the next few weeks that could make their offense even more difficult to stop. 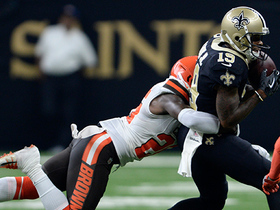 New Orleans Saints wide receiver Ted Ginn nearly costs the game on a muffed punt late in the fourth quarter. New Orleans Saints wide receiver Ted Ginn catches pass from quarterback Drew Brees and runs in 4-yard touchdown. 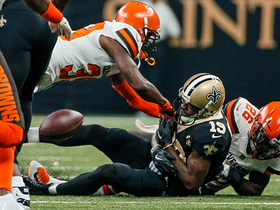 Cleveland Browns defensive back Derrick Kindred forces a fumble from New Orleans Saints wide receiver Ted Ginn for the second Saints fumble of the game. New Orleans Saints wide receiver Ted Ginn catches for a 42-yard gain that sets the Saints up for a game-winning field goal. 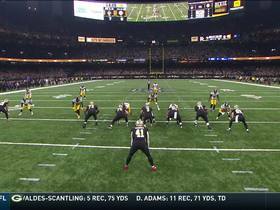 New Orleans Saints quarterback Drew Brees finds wide receiver Ted Ginn Jr. for a wide-open 28-yard touchdown.